Study in Mice Raises Question: Could PTSD Involve Immune Cell Response to Stress? COLUMBUS, OH; February 20, 2014—Chronic stress that produces inflammation and anxiety in mice appears to prime their immune systems for a prolonged fight, causing the animals to have an excessive reaction to a single acute stressor weeks later, new research suggests. After the mice recovered from the effects of chronic stress, a single stressful event 24 days later quickly returned them to a chronically stressed state in biological and behavioral terms. Mice that had not experienced the chronic stress were unaffected by the single acute stressor. The study further showed that immune cells called to action as a result of chronic stress ended up on standby in the animals’ spleens and were launched from that organ to respond to the later stressor. Mice without spleens did not experience the same reactivation with the second stressor, signifying the spleen’s role as a reservoir for primed immune cells to remain until they’re activated in response to another stressor. The excessive immune response and anxiety initiated by a brief stressor mimic symptoms of post-traumatic stress disorder. The Ohio State University scientists are cautious about extending their findings to humans. But they say their decade of work with this model of stress suggests that the immune system has a significant role in affecting behavior. And they are the first to study this re-establishment of anxiety in animals with a later acute stressor. The research is published online in the journal Biological Psychiatry. These scientists previously determined that in mice with chronic stress, cells from the immune system were recruited to the brain and promoted symptoms of anxiety. The findings identified a subset of immune cells, called monocytes, that could be targeted by drugs for treatment of mood disorders—including, potentially, the recurrent anxiety initiated by stress that is a characteristic of PTSD. The research reveals new ways of thinking about the cellular mechanisms behind the effects of stress, identifying two-way communication from the central nervous system to the periphery—the rest of the body—and back to the central nervous system that ultimately influences behavior. “We haven’t proffered that there is a cellular component to PTSD, but there very well might be. And it’s very possible that it sits in the periphery as we’ve been describing in the mouse,” said John Sheridan, senior author of the study, professor of oral biology and associate director of Ohio State’s Institute for Behavioral Medicine Research. In this model of stress, male mice living together are given time to establish a hierarchy, and then an aggressive male is added to the group for two hours at a time. 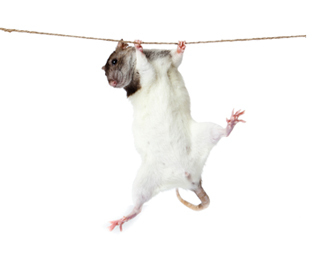 The resident mice are repeatedly defeated, and this social defeat over six days leads to an inflammatory immune response and anxiety-like behavior. After subjecting a group of mice to this chronic stress, researchers tested biological and behavioral hallmarks of the stress response 14 hours and eight days later. At both time points, compared to control mice, the stressed mice showed higher levels of pro-inflammatory proteins in the bloodstream and accumulation of monocytes in the brain, which the scientists had previously linked to anxiety-like behavior—in this case, taking a long time to enter an open space. “Eight days is a long time for anxiety to persist in a mouse,” Sheridan noted. By the 24-day point, these markers and behaviors in the stressed mice had returned to baseline levels. Three groups of mice—the control mice, newly introduced mice to the study and the stress-sensitized mice – were then subjected to acute social defeat: a single two-hour exposure to an aggressive male. Biological and behavioral markers remained unchanged in the unstressed mice. Within 14 hours after the acute event, the stress-sensitized mice had returned to the chronically stressed state, with higher pro-inflammatory proteins in their blood and a return of anxiety, suggesting monocytes had traveled to the brain to bring on those symptoms. “That one exposure to an acute stressor produced a similar pattern to what we’d expect to see if they had experienced the chronic stress of repeated social defeat,” Godbout said. Because a primed immune cell type persisted in the spleen, the researchers removed the spleens of mice after the repeated social defeat-induced sensitization. After that spleen removal, the researchers found that the stress-sensitized mice were no longer sensitive to the acute stressor and the re-establishment of anxiety. The scientists also did not detect immune cell trafficking to the brain or anxiety-like behavior. This finding pointed to the spleen as a source of immune cells responding to the acute stressor. Sheridan also noted that other scientists are testing blood samples of PTSD patients for biomarkers such as immune cells or pro-inflammatory proteins that might indicate the patients are in a stress-sensitized state. “This work will validate some of their approaches,” he said. From here, the researchers plan to compare the profiles of immune cells that travel to the brain versus the spleen during the stress response. "Re-establishment of Anxiety in Stress-Sensitized Mice Is Caused by Monocyte Trafficking from the Spleen to the Brain," Eric S. Wohleb, Daniel B. McKim, Daniel T. Shea, Nicole D. Powell, Andrew J. Tarr, John F. Sheridan, Jonathan P. Godbout. Biological Psychiatry, 11 December 2013 (10.1016/j.biopsych.2013.11.029. Press materials provided by The Ohio State University Research and Innovation Communication.